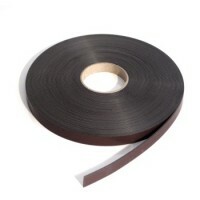 NovaMag is a high quality flexible acrylic self-adhesive magnetic tape widely used in retail or Point of Display. It enables any surface to have magnetic carrier properties with the added benefit of ease of removal. The acrylic adhesive is UV resistant and stable up to 200°C giving a magnetic tape with superior flexibility characteristics of any permanent-magnetic material.